It’s that time of the year. Terrible traffic, cool winds, invasive questions from relatives. What could be better to whet an appetite then three stories about petty crime from Thanksgivings past? As we all know gathering family in one room can be dangerous and while most of us have wanted to jump across the table and stab a sibling with a fork (we here at LPN are huge fans of restraint and you should be too) here is a woman who actually did just that. Last year Shenika Allsup stabbed her younger half-brother in Maryland over what police deemed an “escalated spat”. Her brother was quickly transported the hospital and treated for non-lethal wounds and has since made a full recovery. So perhaps, the next time you see your family, think twice over that small argument, before either of you end up with a fork in your neck. On the same topic of disputes, our next crime takes place over a particularly heated game of Trivial Pursuit in 2013 (hey, we’ve all been there). Two people were supposedly fighting over an answer and one of them pulled what seemed to be a hatchet on the other. For an added twist, when police arrived it turned out the “hatchet” was instead drug paraphernalia. Minus the threat with a hatchet, sounds like a pretty fun Thanksgiving. Finally we have my personal favorite story out of the bunch. This gem comes from 2008 North Carolina where a carjacker was hit with a frozen turkey in an attempt to stop him from taking a car. The carjacker unfortunately made off with the car, but due to the head wound was later recognized by the police as the perpetrator. As they say revenge is a dish best served cold. 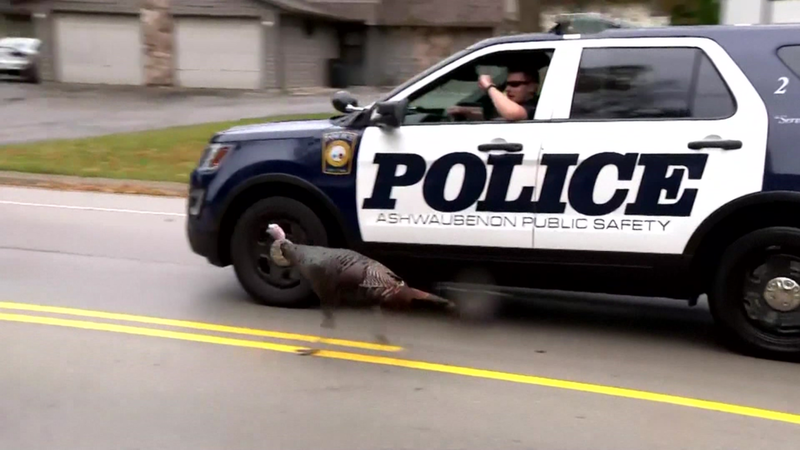 So for this Thanksgiving, instead of arguing, let’s come together and shame others who have committed petty crimes over turkey. Have a Happy Thanksgiving from everyone here at Last Podcast Network, and don’t stab your siblings with a fork! Abrahamic religions — Christianity, Judaism, and Islam — bury their dead rather immediately. In the growing secular world, many people choose to be cremated. However, many options exist outside of these, as is evidenced by different funeral traditions and attitudes towards death around the world. On the Indonesian island of Sulawesi, the Torajan people have a special relationship with death. A dead person who is still home with family is not dead, just makula’, just sick. Shortly after passing, corpses are treated with formaldehyde so that they do not putrify. Then, they are lovingly fed, washed, and spoken to. While the poor can usually only justify keeping the dead for a few weeks before the funeral ceremony, it is a symbol of wealth and power to sustain a years-long relationship with the slowly mummifying corpse as family members from around the world are gathered for the eventual celebratory funeral ceremony. At the funeral, the family sacrifices as many water buffalo as they can afford (one journalist notes that 24 seems to be the minimum) in order to ensure a quick journey to the afterlife after such a slow passing away from this realm. That’s not the end. Every few years, they visit their ancestral tombs for a ma’nene or second funeral. They exhume their dead relatives and share new stories and memories. The corpse’s clothes are changed and family pictures are snapped. The practices on Sulawesi may seem bizarre, and yet it’s common in the Western world for people to pray to their dead ancestors, speak to them through those mechanisms, and even imagine that they’ve been visited by ghostly forms. Torajans just happen to form a relationships with the bodies of the dead rather than the souls. In Tibet, people practice celestial burials. Inhumation space is scarce all over the world, but especially in the rocky mountains of Tibet. Wood is a valuable resource, as fires are necessary for heat and cooking. Western notions of burial and cremation are not particularly feasible in this part of the world. Luckily, their local tradition doesn’t require too many ingredients — just a saw, some barley flour, and yak butter. The bodies of the dead are dismembered and defleshed by a rogyapa or “body breaker.” The meat is pounded with a mallet into a mixture of the butter and flour to entice the local Himalayan griffon vultures, meat-eating birds with 9-foot wingspans. The less tasty parts of the body are laid out first while the tender cuts are withheld so that the vultures don’t cut and run after grabbing the tastiest bits of human. Once the body has been completely returned to nature, the funeral is complete. The vast majority of Tibetans choose to be disposed of in this way. Not to mention the fact that you can get ashes turned into a synthetic gemstone, a vinyl record, or a tree! All of which don’t contribute towards the unfortunate fact that the Abrahamic religions’ full-body-burial traditions have led to rapidly decreasing cemetery real estate on our finite little planet. With so many exciting options out there, it’s hard to imagine that everyone’s sticking with the same old formulae and family plots. Yawn! You might not want to call a yellowish substance with a cottage-cheese consistency “milk,” but pigeon milk is a thing. Like normal mammalian milk, pigeon milk contains protein and fat to nurture their babies. It’s more densely packed with nutrients than cow or human milk, and in a study, chicks fed with pigeon milk were ultimately 16% heavier than those who received the normal baby bird diet of regurgitated insects, worms, and other predictable bird foods. Even more enticingly, they’re packed with antioxidants (any animal that lives its life in urban squalor probably needs an amazing immune system). The milk is produced in a pigeon’s crop, which is a thin-walled storage sac that projects from the esophagus. This is where pigeons usually gather food while eating quickly, saving it to digest once they’re well out of harm’s way. When the pigeon is lactating, fluid filled cells from the inside of the crop are sloughed off and regurgitated into their babies’ mouths. Pigeon lactation is controlled by prolactin, the same hormone that controls lactation in us. Scientists who are sequencing the pigeon genome are trying to isolate the specific genes that cause lactation in birds, with the possible intent to introduce pigeon milk to the market.